Kesh x American Apparel Top, Topshop Skort, Celine Sunglasses, Pieces Clutch, Celine shoes (that I majorly lucked out on after searching for them since SS12). 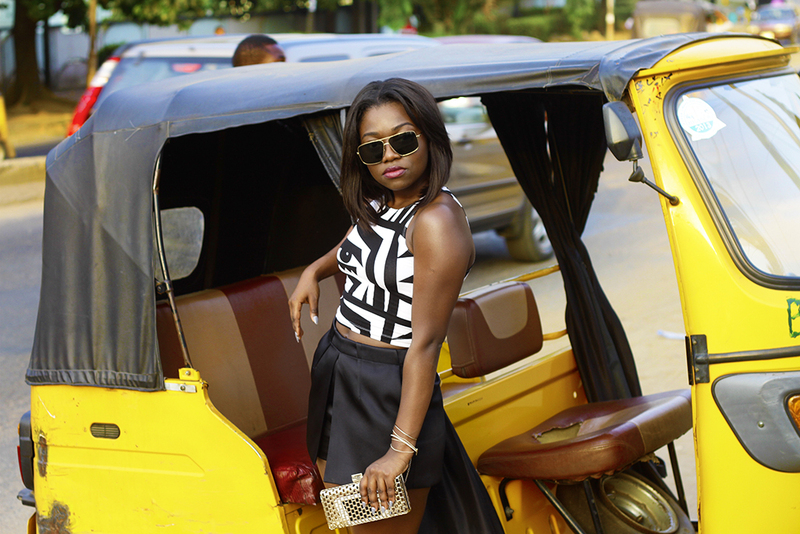 These images were not shot in one of the prettiest settings in Lagos. That's the thing about a good photographer- they make something; or even many things, out of nothing. To London; there's the Big Ben, to Paris; the Eiffel Tower, to New York; the Empire State Building. Tourism is not Lagos's strong point. I don't think we have a single notable landmark. I've never heard a Non-Nigerian say they were going on holiday to Lagos except if they were invited by a Nigerian friend. There's just really not enough to see. If I had to think of one thing that signals Lagos, it would probably be the yellow bus; referred to as 'Danfo' or the yellow 'Keke Napep' as seen in the picture. 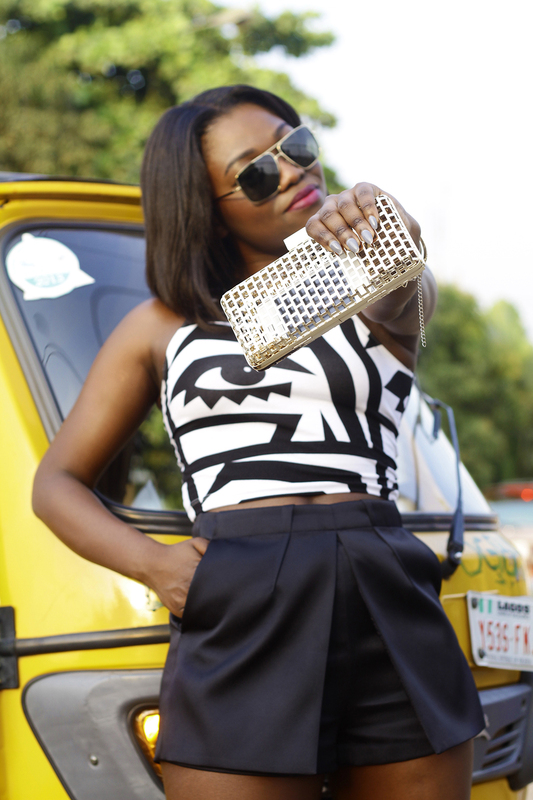 I wanted to shoot an outfit in a typical Lagos scene and we thought this was the best bet. When you go to the Seychelles or Ibiza, you know you're bound to see countless beaches with the bluest waters or the most dramatic chameleon sunsets. The thing is though- it's not only about seeing beautiful places, it's about seeing the beauty in every place. 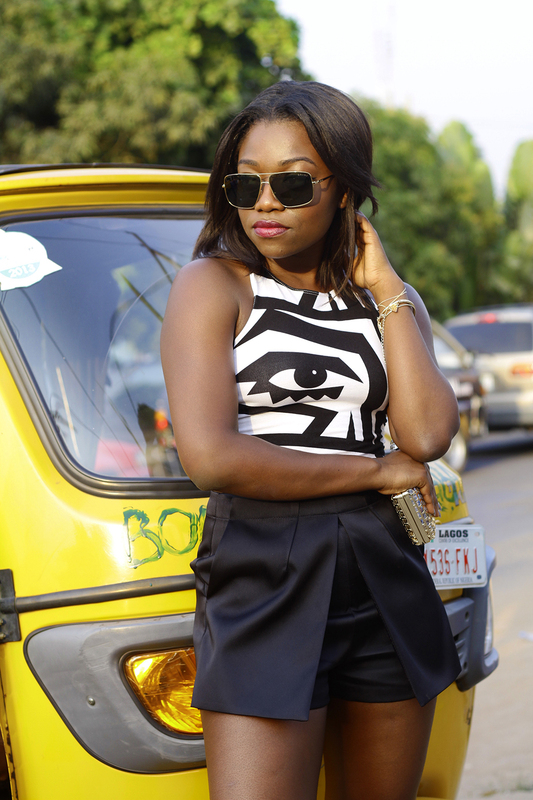 Fashion Blog • My Outfits • Travel Blog | Tagged: American Apparel, celine, keke napep, kesh, lagos | 8 responses. LOVE!!! You make Lagos look good! I’d have to disagree with you, Fisayo. You can’t say there is not really enough to see in Lagos if you haven’t explored. While we might lack prominent places like in new York and Paris, there are a number of little places, unrecognised that are just as amazing. Its a matter of where your interest lies. That’s a good point but I believe I’ve made efforts to explore but found there’s not really much to see. I think you’d be hard-pressed to say Lagos has anything/anywhere as amazing as the Eiffel Tower though. But I’d love to know what places you’re referring to please! Need to check them out.